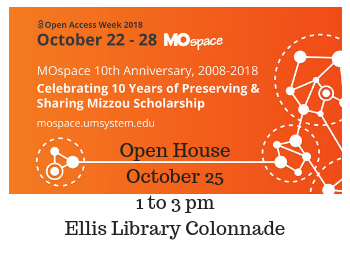 Join us for refreshments and information about Open Access activities at the University of Missouri. Everyone is welcome! The MOspace Institutional Repository is an online repository for creative and scholarly works and other resources created by faculty, students and staff at the University of Missouri (Columbia) and the University of Missouri–Kansas City. MOspace makes these resources freely available on the web and assures their preservation for the future. Open Access is a growing international movement that uses the Internet to throw open the locked doors that once hid knowledge. Encouraging the unrestricted sharing of research results with everyone, the Open Access movement is gaining ever more momentum around the world as research funders and policy makers put their weight behind it.